Pilgrim’s is proud to feature Todd Chapman, of West Fork Farm in Clermont, Georgia. Chapman is consistently in the top third of growers for the Pilgrim’s Gainesville, Georgia, complex in production and performance. Colin Millwood, a service tech at Gainesville, says Chapman is a highly involved farmer, making farming his full-time job. West Fork Farm sits on 140 acres with 12 chicken houses and a small cattle herd. Chapman is a broiler farmer, producing chickens for retail consumption. His farm produces 306,000 chickens per flock, and he manages an average of five-and-a-half flocks per year. That’s a tremendous 1.68 million chickens per year that his farm turns out. Chapman stays on top of the chickens’ comfort with daily diligence on the farm, walking through the chicken houses several times a day to ensure that their safety, temperature and water levels are in order. Maintaining proper temperatures, especially in the hot and humid Georgia summers, is vital to a chicken’s health. Temperatures must be adjusted from very warm when the chicks are delivered, to gradually getting cooler as the chickens reach maturity. In addition to chicken houses, Chapman grows cash crops on several acres of his land. He traditionally grows corn, and this year he’s trying his hand at a soybean crop. He also runs a cattle operation, growing calves to about seven or eight months old and then selling them to other farmers, who grow them for consumption. In order to ensure the future production of his farm, Chapman participates in a sustainability program, which he began in 2007, with the Agriculture Conservation Program of the Hall County Soil and Water Conservation District. The program consists of fencing cows out of the creeks, adding stream bank protection, installing water facilities, constructing a dead bird composter and litter storage facility, and instigating a nutrient management protocol. Litter and composted birds are spread over his crop fields as fertilizer. Chapman has also installed hard surface areas around the cattle troughs, to maintain a higher level of cleanliness. As a result of Chapman’s farming practices, he was awarded the 2000 Outstanding Hall County Conservation Farmer of the Year award by the Hall County Soil and Water Conservation District, the 2000 Farmer of the Year award by the Hall County Chamber of Commerce, and the Rotary Club Farm Family of the Year award in 2004. Chapman says he “fell into” poultry farming because of his father’s connection to it. Mitch Chapman, Todd’s father, worked for ConAgra, part of which Pilgrim’s acquired in 2003, and also had a nearby chicken farm, which he leased out, when Chapman was growing up. On a nearby farm, his parents, Mitch and Ruth, have returned to poultry farming, also with Pilgrim’s. Chapman also credits his experience with Future Farmers of America as a motivator to take up farming. Becoming a farmer was a process, however. Prior to joining ConAgra 16 years ago, Chapman spent 15 years in construction. 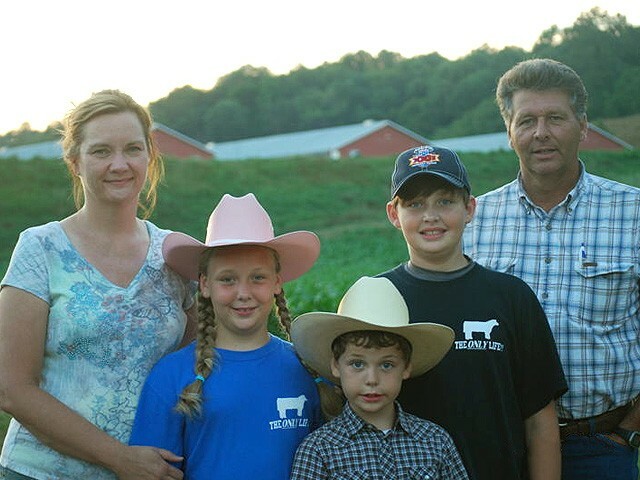 Chapman and his wife, Sheila, a branch manager at the United Community Bank in Clermont, are raising three children: Jess (11), Whitney (9) and Jacob (6) on West Fork Farm. The children help hand feed the baby chicks, put out feed, pick up feeder lids and clean out the chicken houses with their father. “Occasionally there are some things they can do; as they grow older, there’s more they can help with,” says Chapman. The family attends Chicopee Baptist Church and Chapman believes the farm life is great for raising kids. Character is something the Chapman children will likely inherit from their father, as he inherited from his. “He’s a good fellow, a nice guy, honest and dependable. His father is the same type of fellow,” says Millwood. Chapman says he loves farming although some days are harder than others.